Last weekend was a good weekend. 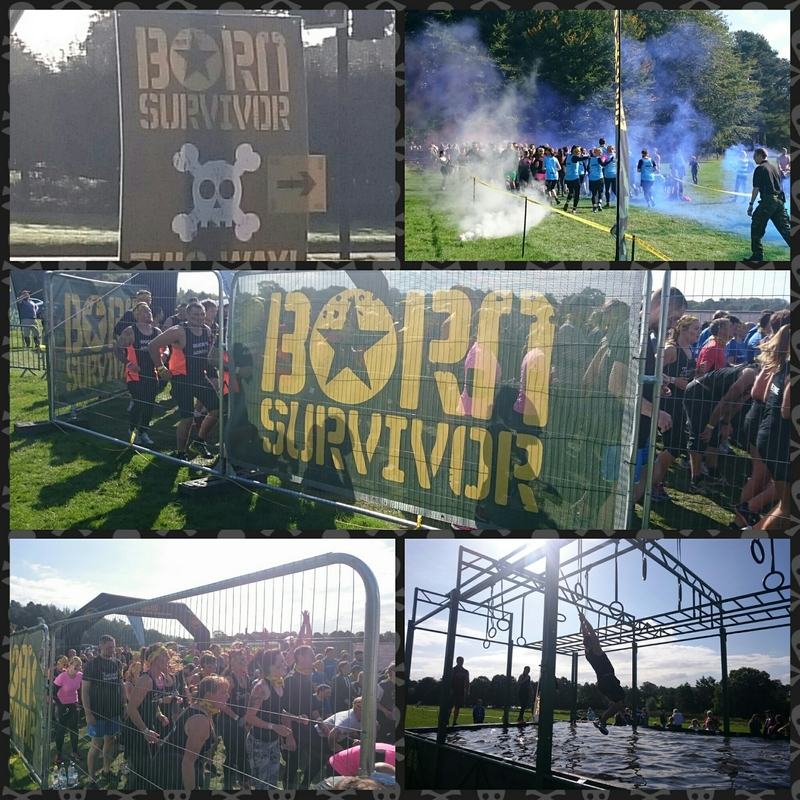 On Saturday morning I was in the first wave of Born Survivor at Capesthorne Hall, Cheshire. This is a 10k muddy obstacle course. Last year I had so much fun doing the marathon distance I thought I’d do the race again (sadly no marathon distance this year). I’ve never been in the first wave of a mud obstacle course race before. It’s quite different to being in the middle group: no queues, the course isn’t quite so churned up, less crowds (both on the course, but also off the course). The pace was blistering, some of the guys in the front with me were keen to get round at pace. Some of the obstacles were quite unremarkable, like various muddy pits and small mounds to get over. At at least one point I saw runners going offcourse only to turn around once they were clearly almost back at the car park! Other obstacles had been well thought out and well designed – the water obstacles in particular. I remember climbing up to the top of a big slide and just hearing the instructions being repeated over and over, barely registering in my kind before “3… 2… 1…” And off I dropped down the slide and into a deep cold trench filled with muddy water. No time to think and overanalyse, just get on with it. One of the classic obstacles in an event like this is the big halfpipe. Last year it was the final obstacle. At all the Tough Mudders I’ve done it’s featured prominently as “Everest”. I have no fear of the obstacle itself, but I have a 100% track record of having been able to get up it, unaided, on the first go. Consequently, every time I see it I don’t want to break the streak of success. This time though, me legs were heavy, my lungs were burning. I spent a few seconds psyching myself up and charged at it, leaping for the lip at the top… Job done! That put a smile on my face for sure. The final obstacle was monkey bars over ice cold water with lots of spectators watching. I find monkey bars straightforward so managed to speed across and get to the finish with no hassles. Under an hour, lots of fun. I’d love to see Born Survivor do some bigger obstacles next year, maybe a few aerial ones with cargo nets. It’s a competitive industry so I hope they continue carving out their niche with innovative obstacles. Sunday morning was the Sandstone Trail race in Cheshire. 17.2 miles on trails with hills for the A race (the B race is 10 miles). I’ve only done this race once before, a few years ago. Given that I’d raced just the day before, I was hoping for a sub three hour finish. Finding the start was hard enough for me, and I followed the “Registration” sign all the way to the boot of a car as it was being packed away, but the friendly organisers quickly got me sorted with my race number and I managed to drop off my kit bag for collection at the end. The race was counted down and off we all went. The first small uphill quickly stretched the ‘A’ race runners out and I was making good time. I felt strong uphill and enjoyed the descents. Apart from a niggle in my right foot I felt great. Right until I landed badly on my right foot on a fast descent and twisted my ankle exactly one mile in. I cursed and watch the hundred or so runners overtake me. I thought about my upcoming marathon – should I press on or stop? My ankle hurt, but it wasn’t blindingly painful, so I decided to start running again. One by one, I picked off the back runners. I felt strong uphill from a summer of going up mountains. I weighted myself heavily on my left leg and continued to pick through the field. I like being at the back and working my way forward, the psychology of overtaking many runners appeals to me. Slowly, I caught up with the first of my running friends, then another. I was told that another couple were just ahead. By the time I reached the first runner from my running club, he made the decision for me as to whether I should continue. He said I was running well and he wasn’t going to be able to keep up, so I figured my ankle must be holding up OK. When I left him, I told myself I was going to finish this race, and finish it in a decent time. Hills rose and fell and I continued to work forwards until I found a natural place in between similarly paced runners. The terrain was varied: mainly trail, through fields, up and down hills, a small bit of road, finishing in Delamere Forest. As the miles rolled on, I didn’t feel tired (not having raced this distance in a while I wasn’t sure how I’d feel). It was hit, however, but I was disciplined in drinking 2-3 cups of water at each of the three water stops, and took an electrolyte capsule at 1 and 2 hours in. I had an energy gel just under the first and second hour, plus thirty minutes before the finish. The race’s last couple of miles wound through the forest. As the finish line approached I even managed to pick off another four runners before dibbing my chip timer in at the finish. The computer printout told me I’d finished in under three hours, which was my intention. Plus I was the first runner in my club to finish. And I’d raced on a twisted ankle for 16 miles! And it also turns out I’d finished faster than I’d thought because I’d initially misread the readout in my post-race oxygen-deprived state. All round, lots of reasons to be happy. I’m still nursing my right ankle a week later, but I’d made the very deliberate decision to keep racing with it, so I won’t complain. I had two good results in two days, both in great weather. The Amsterdam marathon is in a fortnight. I’m confident my ankle will be better in time to run it, though my longest run will have been the Sandstone Trail race, which is a bit shorter than I’d hoped. My race nutrition plans worked a treat, and I started and finished both races in the right nutritional state. I gradually increased my carb intake from midweek and moved to easier to digest forms. On Saturday evening I supplemented my food with a carb heavy sports drink. The aspartame didn’t agree with me but it was a great way of rebuilding glycogen stores before the second race. I’ll have to take some to Amsterdam…. Thanks to Born Survivor and Deeside Orienteering Club for two great mornings out.